If the mind is empowered by what we are calling the right hemisphere, the intuitional level which has its roots in the core’s of one personality, which we also call the heart, then “me” and “mine” disappears and it is “thee” and “thine.” For the core of the human personality, though outwardly seeming individualized, also exists in its universalized form. So what happens to a person is this: He can exist as an individual and yet at the same time be universal, for he has now realized, through his spiritual sadhana , how vast he is. When this happens, a person, being divine, recognizes and experiences this Divinity. If anybody tells you this comes overnight, forget it. It takes time. You’ve got this big load you are carrying, this load of samskaras- all the experiences that you have been gathering up, gathering up, and gathering up in this journey. This bag of imprints through which you cognize existence form the bundle that you are carrying. That is why Christianity says we are born in sin. There is great truth in that. We have brought with us all those samskaras which form our tendencies in life. Essentially the human being is divine; but he does come with this burden. By doing meditation and spiritual practices, properly assigned by a spiritual teacher you draw upon the superconscious energies, the subtlest energies within the relative sphere of life, which flood the dirt away in the subconscious. Modern psychology tries to probe and find causes for things, and they have their interpretations. Why analyze causes? There is a way whereby those subtle energies can be brought forth to clear away the dirt and muck. In this room, if there is a lot of dirt lying around, are you going to analyze the dirt? Or are you going to bring the broom? Which is better? What is the sense of saying this is sawdust, and this is what the wind blew in, and the baby made a wee there! Bring the broom and sweep it out! That is why we say. Take the direct line. And a human being has this ability. That is the journey of which we speak. Man is eternally immortal. He is eternal, and only mind comes in between. Yet the mind can be so beautified that everything in life can be enjoyed. Mira a great poetess of India, wrote a beautiful poem. In it she says: “Oh Lord, I do not want salvation. I do not want to merge away in Thee. But let me be born again and again, and enjoy the joy of worshipping at Thy feet.” How beautiful! The process of life will eventually lead a person to this oneness, this unity consciousness. 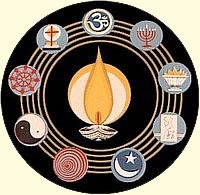 Brahman consciousness. It is inevitable. Everyone has to reach there. Every atom that has been propelled through so-called space, since the time of the “big bang” will have to dissipate its energy, and this very dissipation is the returning back to Silence. Yet, even in duality, there is so much fun. Life is so filled with joy all the time, and what greater joy can there be than the experience of love? To love and be loved: That is the activation of what we call God. Here God does not remain an abstract quality, but becomes a living reality. That is what we want. The lover must truly love the beloved, and not have an assumed love created by dependence. The Bhagavad Gita says to be so established in yourself that no insult can deflate you and no praise can inflate you. You need not go on living at the ends of the polarities of the mind but be centered in the center. Then nothing can affect you; then you experience the joy. Now that is the journey. In this whole flux of life, this contraction-expansion, the element of joy is always there. It is this very element of the Manifestor contained within all manifestation which is bliss and joy. This flower that gives fragrance is giving off particles of itself. When you inhale the fragrance of the flower, you are actually taking within yourself particles of this flower. And like this the Manifestor exists in all its manifestation, for, to use theological terms, the Creator and the creation are but one. One cannot exist without the other. Illusion starts when we put emphasis on the wrong thing- when we do not put emphasis on reality, which is the Manifestor, but we put it on the manifestation. That is the illusion. When people say, “Oh, everything is just a dream,” know that the dream, too, is real, while you are dreaming. Why call it unreal? As you are dreaming you are activating subtler energies. A dream is totally real. So many factors, through various experiences in this life or in other lifetimes, come together to create a story in the mind, and that is real. Every thought you think, every word you say, is real. What we need to be concerned about is, how is it going to rebound on us? That should be our concern. In simple words, you will reap what you sow. Do you see the deeper meaning behind these simple sayings? If you throw a ball against an electronic wall, it will bounce back so hard that you won’t have a chance to shift away. It will knock you out. But throw a ball against a cardboard wall and it will bounce back slowly. Like that, may we direct all our actions and all our thoughts, so that they do not bounce back upon us negatively, but positively. Whenever I pass a park and have some time, I stop, sit down, and watch the children play. It is so beautiful. There is even beauty in the child’s crying as well as in the laughter. All is beauty. For without the child experiencing the pain of falling down and bruising its knee, how is it ever going to experience the value of that which is opposite? So here we are enmeshed in all these opposites, and again that is the journey. When the realization dawns that I have come from nowhere and I am going nowhere, now here: then we begin to live. Ah!. Not the living dead- We live!